All of our teachers are professionals with years of experience as principals in their orchestras and teachers at some of the most reknowned music conservatories in the world. Teachers for the Music Academy include some of the most awarded players and conductors in the world. Extended biographies will be available soon. 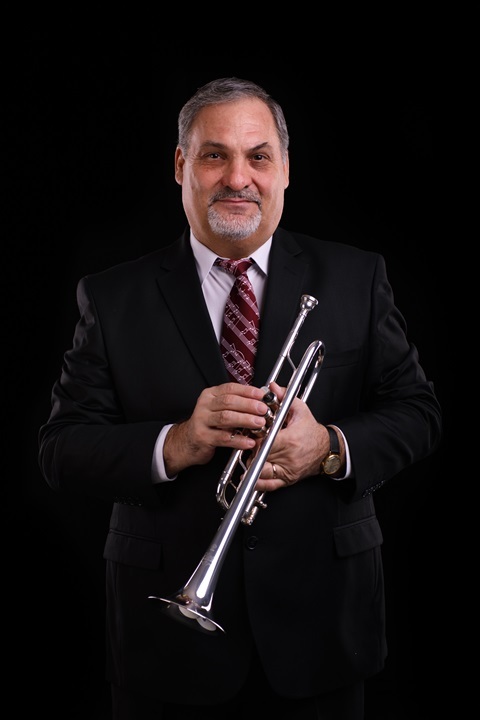 Marco was Principal Trumpet of Maggio Musicale Fiorentino Orchestra — Florence and the Accademia di Santa Cecilia Orchestra — Rome and also guest Principal Trumpet with the Chicago Symphony Orchestra and the Filarmonica della Scala Orchestra. As soloist he has performed with the orchestras of the Maggio Musicale Fiorentino, English Chamber Orchestra, Vienna Kammerkonzert, I virtuosi del Teatro alla Scala, Max-Plank-Philharmonie München, Junge Philharmonie Salzburg, Marchigiana Philharmonic and the Symphony Orchestras of Mantua, Bolzano and Vicenza. In 2014 he made his debut as conductor, working with the San Remo Symphony Orchestra and the Haydn Symphony Orchestra of Bolzano. Marco has released four solo recordings and has given masterclasses in USA, Argentina, Russia, China, Canada, England, Greece, Germany and Austria. Since 2007 he is trumpet professor at the Bolzano Conservatory of Bolzano, Italy. He is a Yamaha Performing Artist and Wedge Mouthpiece Endorsing Artist. Sergiu is a virtuoso trumpet player from Moldova who completed his post-graduate studies in Paris at the Conservatoire National Supérieur de Musique. In 1989, he was founder of the Moldova Brass Quintet and in 2007 he founded the Romanian Brass Society. 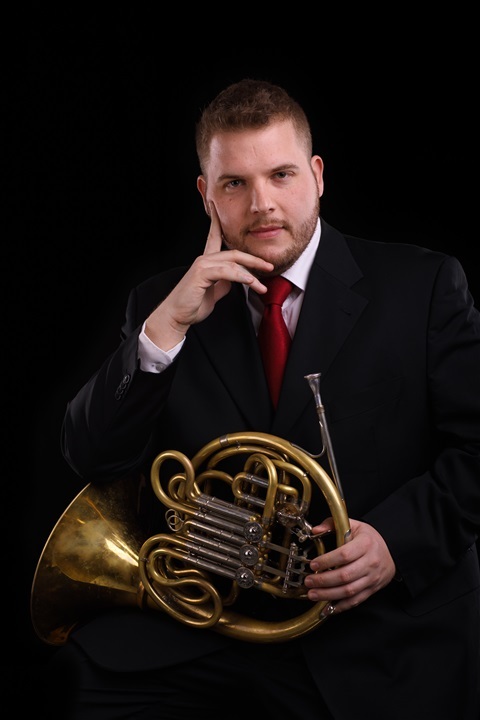 Sergiu has participated as a jury member in dozens of international brass wind competitions. 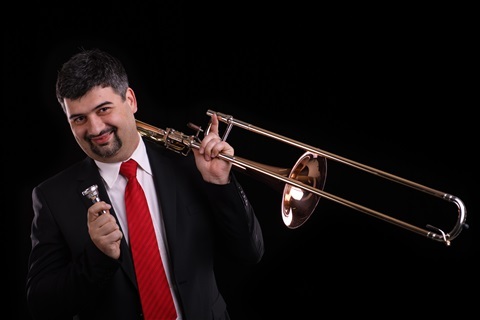 Since 2001 he has been principal trumpet of the Romanian National Opera in Timisoara. As a soloist Sergiu has performed in France, Israel, Italy, Germany, Austria, Spain and in many other European countries with various orchestras, piano accompaniment, organ and string orchestra. Since 1978 Sergiu has been a professor trumpet at various Moldovan universities, high schools and conservatories. Currently, he is the principal trumpet at the Opera Națională Română Timișoara, România, and teaches at the Universitatea Națională de Muzică din București and the Facultatea de Muzică a Universității de Vest Timisoara. He regularly gives masterclasses in higher education institutions throughout Europe and in Canada. 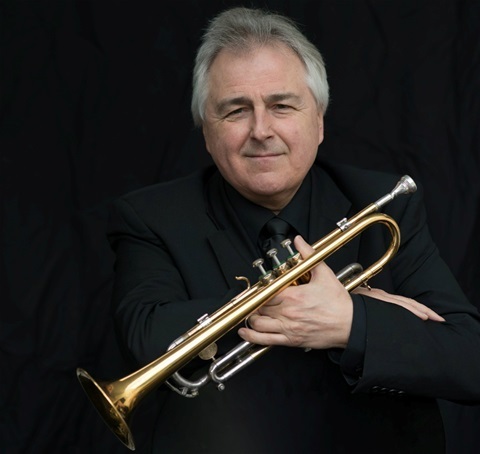 Paul has been a principal player in the Orchestra of the Royal Opera House, Covent Garden, London Sinfonietta, BBC National Orchestra Wales and is currently principal trumpet and Chairman of the London Mozart Players and principal trumpet of the Britten Sinfonia and Orchestra of St John's. As a chamber musician he was a member of the Philip Jones Brass Ensemble and is artistic director of English Brass and English Brass Academy. He is also a member of the innovative chamber ensemble, Fibonacci Sequence. His performances span many genres: classical, commercial, film, pop, folk and contemporary. His career as a soloist began when he was a prizewinner at the Toulon Prix de Concours and he now performs the solo repertoire regularly with UK orchestras. As a commercial artist he has recorded with many artists including Barbara Streisand, Shirley Bassey, Sir Paul McCartney, Bloc Party and Oasis and his film work includes Batman, Gladiator, Lord of the Rings and Harry Potter and Shrek. 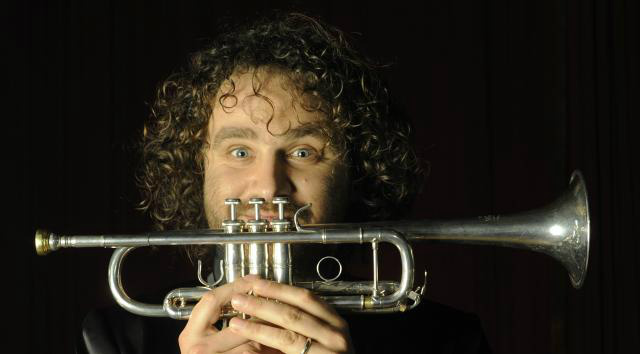 His interest in folk music stems from his work with the iconic folk/rock group, Home Service, and he is currently musical director of Regent Brass, one of the UK's finest brass bands. Paul has been a professor at the Royal Academy of Music, Royal College of Music and was Head of Wind, Brass and Percussion at the Guildhall School of Music and Drama. He now regularly gives masterclasses throughout Europe. His arrangements and compositions are published by Brass Wind Publications for whom he edits two series of brass music: English Brass Collection and Paul Archibald Collection. He is artistic director of his own label, Brass Classics and his discography includes Joie de Vivre, Divertissement and Peter Maxwell Davies’ Trumpet Sonata recorded for the composers own label, Max Opus. As a conductor Paul's discography includes Proclamation, with the International Celebrity Trumpet Ensemble and Hodie Gloriosa with the London Mozart Players Brass Ensemble. His recording of the Shostakovich Concerto for trumpet, piano and strings with Alain Lefèvre (piano), Mathias Bamert (conductor) and the London Mozart Players was awarded Canada's prestigious JUNO award for best Classical Album in 2010. In 2003 he was elected as a Fellow of the Royal Academy of Music, London. Dániel was born in Budapest, Hungary. After he recieved his highschool degree in the Béla Bartók Conservatory in the Hungarian capital, he started his studies in the horn class of Prof. Ferenc Tarjáni at the Ferenc Liszt Academy of Music, where he got his diploma degree in 2008. He then continued his post graduated studies at the Universität der Künste Berlin. Berlin (DSO), and the Ensemble Modern Frankfurt. 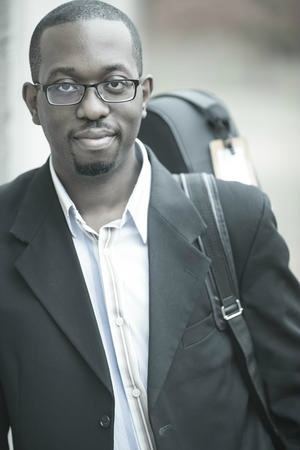 As a soloist, Dániel gave performances of the Haydn and Weber Concertinos throughout Germany and France. Gutierrez (Mexico) and in Istanbul (TR). 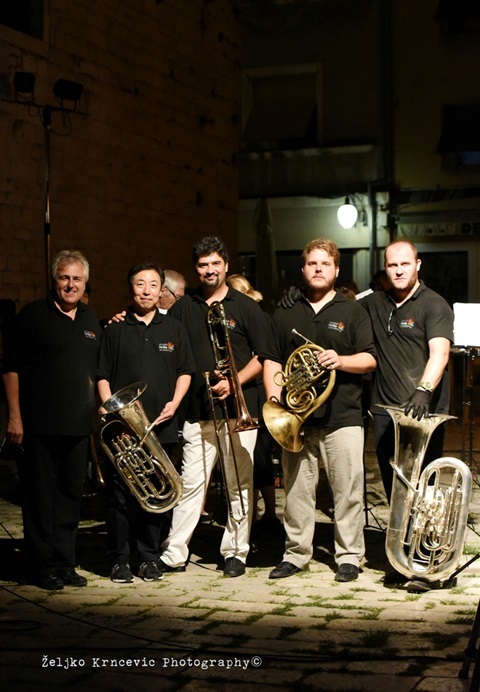 Dániel is principal horn of the Zagreb Philharmonic since 2012 and a member of Busina Brass Quintet since 2013. Ivan was born in Osijek, Croatia. He took his first lessons in trombone with his father and then continued his education in the Music School in Šibenik, in the class of prof. Mihajlo Bošnjak where he graduated in 2000. During that time he won the first prize at the 38th National competition of students of music and dance in Rijeka. In 2000 he enrolled at the Music academy „Ino Mirkovich“ in Lovran where he studied in the class of Branimir Slokar and Uroš Polanc. During his studies he won the first prize at the International music competition held in Alice bel Colle in Italy. 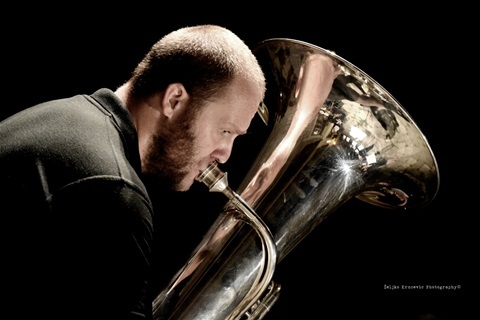 While still attending his final year of studies he won the audition for the position of Principal trombone at the Croatian National Theatre Orchestra in Zagreb in 2003. He graduated at the Music academy of the University in Zagreb in 2005. Beside the position of Principal Trombone, Ivan is an active soloist and chamber musician with the Busina Brass Quintet. He appeared as soloist with orchestra and gave master classes for trombone and low brass on several occasions in Japan in 2010 and 2012 with Tokai Sagami High School Wind Orchestra and Tsuruoka Higashii Wind Band. Ivan is also the founder and President of the Croatian Association of Trombone and Tuba players – Busina. He also holds the position of Music teacher at Private Gymnasium Marul. He has been the Artistic director of the Zagreb Brass Festival since its founding in 2009. Since October 2013, he has been invited to perform as Principal trombone with the No Borders Orchestra, an orchestra that features the best musicians from the ex-Yugoslavian states. Since 2014, Ivan is an International Artist in Residence with the English Brass Academy. Since 2016., Ivan is the vice-president of the Croatian Association of Orchestral and Chamber Musicians, one of the highest authorities on classical music in Croatia. Bass trombonist and Global Music Award Gold Medal Winner Martin McCain’s career as a musician spans an impressive scope of genres. A third-generation musician, he maintains a versatile performance schedule as a soloist, chamber, orchestral and jazz/commercial musician. According to the International Trombone Association Journal, his playing has been described as "solid and masterful". McCain is in high demand as a performer and clinician throughout North America, South America, Europe and Asia. His performances and arrangements have been broadcast on Austin’s 89.5 KMFA, Tucson’s 90.5 KUAT, Chicago's 88.5 WHPK, Toronto's 98.5 CKRW and Hong Kong's RTHK 4 radio stations. Martin has appeared as a guest artist at the International Trombone Festival, Great American Brass Band Festival, Zagreb Brass Festival, Brazilian Trombone Festival and American Trombone Workshop. He is the leader of the award-winning jazz trombone ensemble, JazzBonez and a member of the highly-acclaimed Minor 4th Trombone Quartet. Martin regularly performs in recital programs both as a soloist and as the McCain Duo with his wife, pianist Artina McCain. As an orchestral musician, he regularly appears with the San Antonio Symphony and Austin Symphony in addition to various summer festival orchestras. He has also performed with the Malaysian Philharmonic Orchestra, Houston Symphony Orchestra, San Antonio Opera, Austin Opera and Charleston Symphony Orchestra. As a jazz musician, he performs with the NOW Jazz Orchestra, Jazz Inc. Big Band and other commercial touring ensembles. His 2016-2017 season highlights will include various performances in concert series and university residencies in Tennessee, New York, Hawaii, Toronto, Washington DC and Columbia in addition to a CD release. Martin was a prize - winner twice in both the International Trombone Association's Donald Yaxley Solo Bass Trombone Competition and Kai Winding Jazz Trombone Ensemble Competition and twice in both of the American Trombone Workshop's National Bass Trombone Solo Competition and Jazz Trombone Ensemble Competition. He has been a featured soloist with the Croatian Army Band and the United States Army Brass Quintet. In addition to being heard on various recordings on the Summit Records, Naxos and Equilibrium labels, Martin has released three solo CDs Trombone Czar: Russian Treasures Recorded Live! (2012), Shades (2014) and Trombone Czar: The Extended Version (2015). He is a four-time winner of the Global Music Awards, receiving a Bronze Medal for the CD Shades, two Silver Medals for the CD Trombone Czar and as an Emerging Artist and a Gold Medal for Best Instrumentalist. Martin was also featured in a recent edition of Billboard magazine. Martin is an Associate Professor of Music and Artist/Teacher of Trombone at Texas State University where he directs the Trombone Choir and Jazz Trombone Ensembles. Under his leadership, the Trombone Choir and Jazz Trombone Ensembles have been invited to perform at the International Trombone Festival, American Trombone Workshop, Big 12 Trombone Conference and Texas Music Educators Association Convention on numerous occasions and have released two commercial recordings. Dr. McCain’s students have also been extremely successful in solo and ensemble competitions including the International Trombone Association competitions, the American Trombone Workshop competitions and the Big 12 Trombone Solo Competitions. He is also the founder/director of the Texas State Trombone Symposium. In addition to his duties at Texas State, Martin spends the summer on the faculty for the Austin Chamber Music Center Festival, Interharmony International Music Festival (Italy), Blue Lake Fine Arts Camp, SliderAsia Music Festival (Hong Kong) and the English Brass Academy (Croatia). Martin McCain is a performing artist for Michael Rath Trombones, Reunion Blues and plays on the “McCain” signature mouthpiece series manufactured by Pickett Brass. He is also an affiliate of AirTurn and The GigEasy. Željko Kertez, Tuba, was born in Koprivnica, Croatia. After he finished elementary school in Koprivnica, he enrolled in Varaždin Music School in the class of prof. Stjepan Rukljić. During his education he won the first prize at the 38th National competition of students of music and dance in Rijeka. Soon afterwards he passed the audition for the Orchestra of the Middle European Initiative, where he played for two seasons. After he graduated in the Music school in Varaždin, he enrolled in the class of prof. Šime Vulelija and Danijel Rajković at the Music academy of the University of Zagreb where he graduated in 2005. In 2005 he won the audition for the Mediterranean Youth Orchestra, where he played for one season. He has attended master classes with the eminent world soloists such as Jens Bjorn Larssen, Henrik Jan Rennes, Ben van Dijk, Mel Culbertson, Walter Hilgers and others. He is also active as a pedagogue and he was invited to teach at most important student music camp in Slovenia – UPOL OrkesterkamP. Željko holds the position of Solo tuba at the Croatian National Theatre in Zagreb since 2005. He is also active as a soloist and he appeared with the Tokai Sagami Wind Orchestra in Yokohama in 2013, where he performed the Artiunian Tuba Concerto with great success. He is engaged as conductor of the Kutina Municipal Brass Orchestra - Kresimir. He is also active as a chamber musician in the Busina Brass Quintet. Since 2014, Željko is an International Artist in Residence with the English Brass Academy.